Towards the end of last year, the fourth volume in the series Dissidents of the Workers Movement from Unrast publishing appeared. The series was started with a certain enthusiasm in 2008/9. Anthologies of the writings of Cajo Brendel, Raya Dunayevskaya, and Christian Riechers were published. All three are well recommended (note that the Dunayevskaya book in this series is a translation from the English), as they feature hard to find and important texts of different currents of anti-Leninist Marxism. Unfortunately, after the first three volumes came out, there was a pause in publication for several years before this fourth edition was finally released. The new volume differs from the previous ones insofar that it isn’t an anthology of texts, but the transcript of an interview, which Michael Buckmiller conducted with the council communist and crisis theoretician Paul Mattick (1904-81) in 1976, titled The Revolution Was a Big Adventure for Me. Buckmiller published his dissertation about Karl Korsch in the same year and had been the editor of Korsch’s collected works since 1980. He met Mattick in the context of his research. The extensive interview focuses on Mattick’s biography, which is an anomaly insofar that Mattick mostly put his personality in the background. He was born in 1904 and at the age of 14 joined the Free Socialist Youth (FSY), a group that was already to the left of the USPD (Independent Social-Democratic Party) and that soon joined the newly formed Communist Party. Enthusiastic for the German November Revolution, he was elected to an apprentice council. When the Communist Party split in two, his section of the FSY unanimously joined the Communist Workers Party (Kommunistische Arbeiterpartei Deutschlands, KAPD). With this, his political way was set on course, and he is one of the few who stayed faithful to the KAPD after the revolutionary wave started receding. The KAPD was constituted from the left wing of the KPD which was expelled in the autumn of 1919. It rejected participation in parliamentary elections as well as the Leninist conception of the party. It was in favour of an immediate dictatorship of the workers’ councils, but as early as 1920 denounced the Bolshevik tendency towards a dictatorship of the party. This schism in the communist movment is of a crucial historical importance as it was a fundamental and world-wide one. 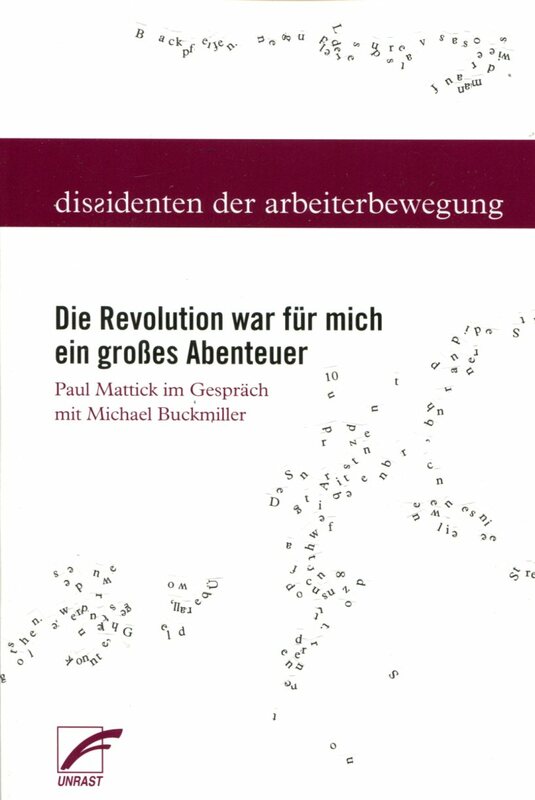 By 1976, Mattick was one of the few who was still alive who had been around since the beginning, and who had been directly connected to the struggles of the communist left for all his life; beginning in Germany as a member of the KAPD and the AAU (the Allgemeine Arbeiter Union – a kind of radical anti-trade union in the sense of going beyond the reformist limitations of trade unions), and continuing on after emigrating to the U.S. in 1926 with the Proletarian Party and the Council Communists. In Germany he strarted publishing in the Kommunistische Arbeiterzeitung and the Kampfruf, the organs of the KAPD and the AAU respectively. Since the interview has a more biographical than theoretical character, we find out a lot about the everyday lives of the militants, the struggles of the revolutionary expropriators, and Mattick’s life between the ‘two worlds’ of the militant workers and the left radical boheme. In 1926, he went to the U.S. and found himself in Michigan. He joined the Industrial Workers of the World (IWW) and took part in regular meetings of the Proletarian Party. Reading Henryk Grossman’s The Law of Accumulation, Being Also a Theory of Crises became an intellectual key experience which resulted in a new reading and understanding of Marx. ‘Many people started to read Marx anew. It was like a miracle, suddenly they realised, well, what the Leninists say about Marx isn’t right at all, Karl Marx is something altogether different’. Soon he gathered the anti-Leninists in the Proletarian Party around him, who went on to found the Groups of Council Communists. At first they picked up publishing the Chicagoer Arbeiterzeitung in German. They intervened in the unemployment movement especially in the period between the stock market crash of 1929 and the effective introduction of the New Deal around 1934. From that point onward three magazine projects were launched in succession: International Council Correspondence (1934-38), Living Marxism (1938-41) and New Essays (1942/43). These papers also appeared as part of an international network that saw especially close collaboration with the Dutch council communists. Thus there were relationships with Anton Pannekoek and Jan Appel, but also with Karl Korsch, Heinz Langerhans and others. At the same time this was a period of decline for the revolutionary movement, the waves of counter-revolution (in its bourgeois, fascist or Stalinist variations) spared no corner of the world. After the failure of the proletarian revolution in Germany (1919-1923), the anti-authoritarian organisations fell apart. KAP and AAU proceeded to split into various factions, moving from being mass organisations to splinter parties. The once mighty IWW in the U.S. was also in decline, a process that set in after the defeat of the great strike in Colorado in 1927, continued throughout the ‘30s and turned out to be irreversible. In addition to this, it was difficult to finance the organisational and publishing activities of the radical left. According to Mattick, the KAPD and AAU were financed by expropriations; the money that was looted by the ‘gangs’ of Karl Gonschorek, Max Hoelz and Karl Plättner, however, was not only used to bank roll the party and the union, it also was distributed directly to proletarians in need. All this was only possible in a phase of acute revolutionary situations. Mattick had to pursue his normal breadwinning job, thus he couldn’t dedicate his time exclusively to studying and writing, especially as the active political agitation consumed a lot of his time. When he became unemployed he finally did have more time to study and write, nevertheless, financial problems remained omnipresent. After the discontinuation of New Essays, the last print production was a publication of Pannekoek’s Lenin as Philosopher. This text, which every communist should have read, barely found any readers in 1948. A reason might have been that on the one hand the Stalinists had gotten hold of the brand ‘Communism’, and on the other, many in America turned away from the left in general under the impression of the beginning cold war and McCarthyism. In this period, the Matticks’ ‘hibernated’, living almost self-sufficiently in a house in Vermont they had built themselves. Still there were regular publications of analytical articles and book reviews by Mattick in journals such as Western Socialist. When the New Left emerged in the ‘60s, there was also a resurgence of interest in the dissidents of the workers’ movement. By the late ‘60s, many books by Mattick appeared, some even through larger publising houses. Amongst them was what is widely considered his main work: Marx and Keynes. The Limits of the Mixed Economy, which was published in 1969 both in its American original version and in a German translation. At the end of the interview with Buckmiller, Mattick calls himself not a crisis-theoretician, but a catastrophe-politician, out of the conviction ‘that there is no revolution without a crisis’. This crisis is produced by the economy itself, because ultimately the capitalist economy cannot be consciously controlled. Besides the nearly 100-page interview, the book contains four short stories by Mattick which originate in the early years of his work, as well as an extensive afterword by Michael Buckmiller, which is well worth reading and titled Paul Mattick – ein proletarischer Intellektueller. Buckmiller describes the circumstances of the interview and his friendship with Paul and Ilse Mattick. He also goes into the connection of Mattick with Fairfield Porter, which – retrospectively surprising to Buckmiller – was not mentioned in the interview. After all, it was Porter who had financially supported the publications of the early ‘30s and who had doubtlessly also been a close personal friend at the time. For this reason, an extensive quote from a letter by Mattick to Porter complements the main text. Die IWW war die einzige revolutionare Vereinigung in Amerika, die uber Staats- und Sektorengrenzen hinweg alle Arbeiter mit dem Ziel der Vorbereitung eines gro?